"This moving story is sure to delight and inspire young hearts." I live in Colorado Springs and Milo has been with us since May 27, 2008. He may have been one to two weeks old at that time. Someone visiting from Seattle found him wandering in a canyon by himself. He was crying. These people thought he was a duck and I didn't know what he was until I started looking on the internet and comparing pictures to what he looked like. 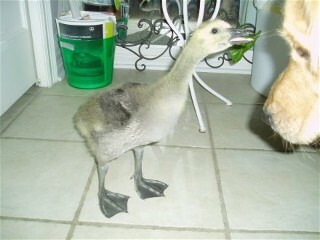 Anyway, Milo is definitely a Canada goose and a beautiful one at that! We have three golden retrievers and they're wonderful with Milo. 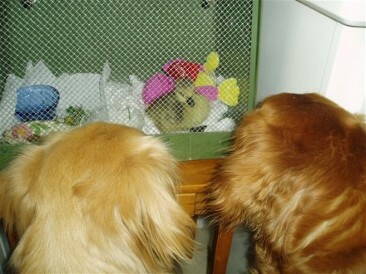 As a matter of fact, they seem to watch over him but they also seem to be very respectful. We took Milo to a lake right near us that is on the golf course where we live. There are about two dozen or more geese that stay around this lake. We took some crushed corn with us and they all came to us. We introduced Milo to them while feeding them. What a neat experience to be able to get so close to all of them. 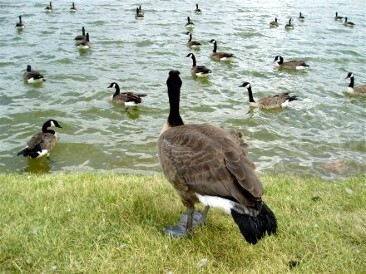 I enjoy the times at the lake and seeing and getting to know the other geese. It brings a lot of peace to me plus all of the excitement to see Milo fly and having a great time in the lake. The other geese do not seem to want to accept him. Some rush at him and on two different visits, one goose rushed at him and pulled out a mouthful of feathers from Milo's bottom. There's a family with three goslings and we were hoping they'd take him but no luck so far. We adore Milo and want to do the best for him. I run with him to exercise his legs and wings and can see that he is getting stronger each day. He opens his wings and does exercise them but does not seem interested in flying. He will take some short flights into the lake and do some low flying above the lake. Milo loves to swim like a Porpus. I've never seen another goose swim like Milo does. I can always pick him out in a group of geese. Milo loves to ride in our golf cart and the passenger seat of our car. Of course, he knows by now that when we're putting him there, we're taking him to the lake. 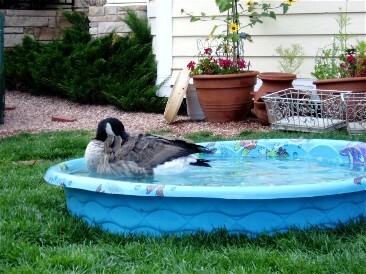 My sister bought Milo a kiddie pool and what a great time he has in it! WOW, this has been such a beautiful experience for us to raise this sweet spirit, Milo. We are very attached to him and him to us. He is very much a part of our family. I'm still hoping that he will be accepted by the other geese or that he will choose to join them. But until that time, we will take care of him. When and if he leaves, we will be sad but he definitely deserves the choice. 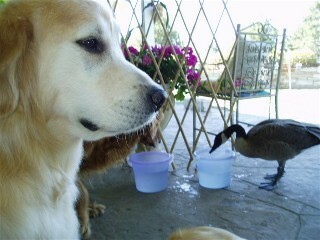 DECEMBER 18, 2009: Milo left with some wild geese on Dec. 18. I haven't written you until now because every time I tried to write I would start crying....my eyes are starting to fill with tears now. 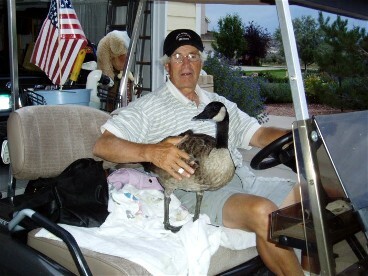 However, I am thrilled that I was successful in raising Milo to become a beautiful & strong Canada Goose; teaching him and practicing flying along side of our golf cart, all of the socialization with other geese, swimming lessons, etc., but OH, how I miss him/her. We developed such a love for him......so did my 3 Golden Retrievers. 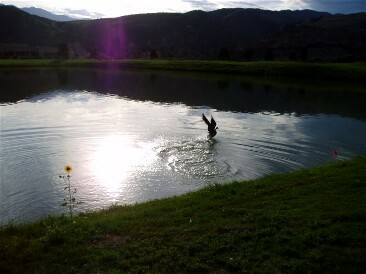 This experience of knowing a Canada Goose will forever remain in our hearts and souls. They truly have qualities that many in the human race LACK. My goal was met. Milo is out there flying over the Rockies and maybe has even found a mate by now. I will continue to go to the lake where we spent so much time together........maybe, he will show up this Spring with his new family. I hope so.